The health benefits of raisins include improving digestion, bone health, and iron levels. They also help treat acidosis, bloating, anemia, fever, and sexual dysfunction. They have also been known for aiding in a healthy weight gain, as well as for their positive impact on eyes, teeth, and hair. Raisins may be tiny in size but they are good for you as they pack a nutritional punch. They are considered part of the fruit group, according to a report by the USDA Center for Nutrition Policy & Promotion. These dried fruits boost energy and are usually added to health tonics, snacks, and compact, high-energy food supplements for mountaineers, backpackers, and campers. A 43 gram serving of raisins contains around 129 calories. Since they are high in calories, it is recommended that in a day, you should eat ¼ cup of raisins or 1 small snack box (one and a half oz.) which is available in most grocery stores. As per USDA National Nutrient Database, raisins are a good source of energy, fiber, protein, and carbs. They are high in sugar and calories but have a low glycemic index. Raisins contain zero cholesterol and are also rich in potassium, vitamin C, calcium, magnesium, phosphorus, and sodium. They contain vitamins and minerals such as thiamin, niacin, riboflavin, vitamin B-6, iron, and zinc. 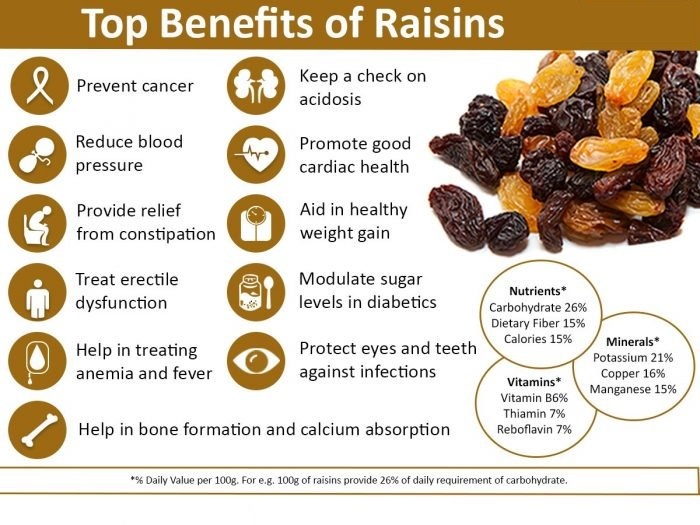 Let’s take a look at the powerful health benefits of raisins in detail below. Raisins have an abundant supply of fiber in them, which helps to absorb the natural fluids present in the body. This adds bulk to the food moving through the intestinal tract and ultimately helps give relief from constipation. This type of fiber is considered insoluble fiber because it takes in water to gain volume. A study by Dr. Gene Spiller, director of the Health Research and Studies Center of the Sphera Foundation in Los Altos, California, confirms that adding just two servings of raisins per day can improve colon function and may decrease the risk of colon cancer. The fiber in raisins helps sweep out toxins and harmful materials from the digestive tract. This can protect people from intestinal diseases, bacterial growth, and discomfort from bloating. Raisins rich in potassium and magnesium, are a natural remedy for acidosis. Potassium and magnesium are two of the most common components of antacids because they are considered basic on the pH scale. Acidosis is a state of increased acidity of the blood (also known as toxicity of the blood) or the gases in our respiratory system that may cause boils, skin diseases, damage to the internal organs, gout, and renal calculi.